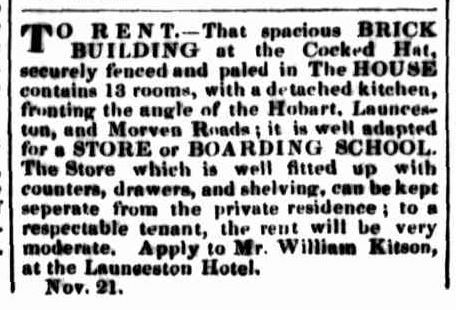 Launceston Examiner, 6 December 1845. 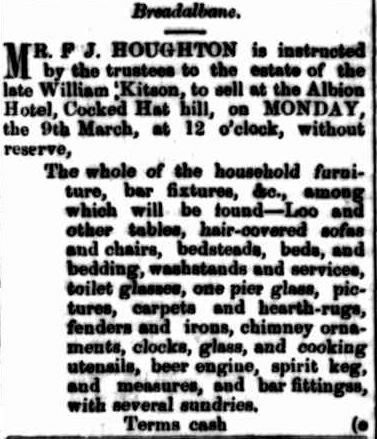 William George Pilbeam, Albion Inn, Cocked Hat.No convictions, well conducted. Granted unanimously. BURGLARY & ROBBERY.–On Thursday night a burglary and robbery was committed at the Albion Inn, Cocked Hat. The thieves effected an entrance by a window at the rear of the premises, and ransacked several rooms with very great deliberation, finally talking away two watches, and other property to the value, altogether, of about £50. Timothy Sullivan applied for a license at the Cocked Hat, district of Morven. 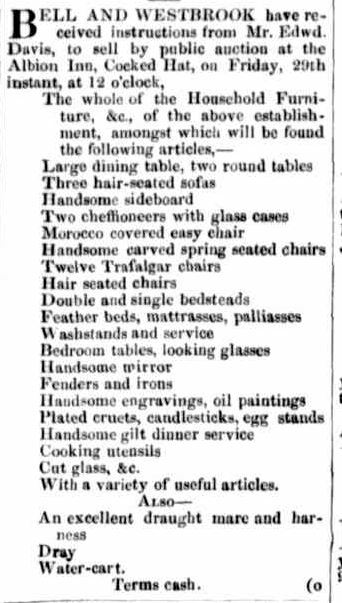 The premises for which applicant applied were lately occupied by Mr. Pilbeam, but Mr. Pilbeam finding the premises inconvenient, obtained permission from Mr. Wales, the assistant P. M., to remove to an adjoining house. A letter was read from Mr. Wales addressed to the Court, recommending the application for this reason, among others that the police would have more control where there were two public houses, as it would prevent parties congregating at one house, &c.
Mr. Theodore Bartley objected to Mr. Wales’s views ; he thought the house occupied by Mr. Pilbeam quite sufficient, and that where a multiplicity of Licences were granted publicans were obliged to descend to artifices to draw custom ; applicants instead of waiting for the Annual meeting had got into the habit of trying to smuggle licences from the-quarterly meeting. He should upon principle oppose this application. Mr. Rocher (for the applicant) stated, that the premises had been licensed for upwards of twenty years, (No no, from the bench, only 10 years 😉 well, for ten years ; it also belonged to an old colonist, Mr. Scott ; the license had been illegally removed by Mr. Wales ; the applicant came highly recommended. He would also call their attention to the extract of the Police Magistrate’s letter “I do not oppose a fresh license as the police can have more control over disorderly characters when there are two houses.” The premises had been efficiently repaired, and if the license was refused Mr. Scott would be a great loser. Mr. Douglas in reply said he would put the matter simply before them ; the land originally belonged to Mr. Scott, who had not resided in the colony for many years, it was rented to Mr. Solomon, and by him sub-rented to Mr. Pilbeam, who had at a great expense erected the house to which he had lately removed. The argument used in favor of granting the license, was that the police would be more able to restrain gambling among the lower orders such as the “Devil among the tailors” “Ringing the bull,” &c. If such was the case, there were plenty of houses already, two at Franklin Village, and others situate on the line of road. Mr. Wales had acted upon this authority ; had, in fact, done (as Assistant P.M.) what only the Police Magistrate of Launceston could do. It being the opinion of the Court that a second house was not required at the Cocked Hat, Mr. Sullivan’s application was rejected. The point, with regard to Pilbeam’s house, remains as before. The Bredalbane Annual Ball.— The third annual hall at the Albion Inn, will take place to-morrow evening. 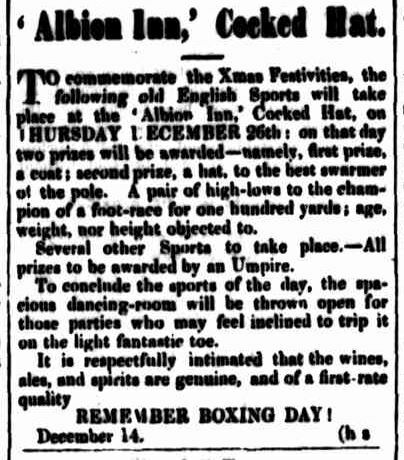 The ability, respectability, and liberality with which Mr. and Mrs. Davis conduct the balls at the Albion Inn are so widely known, that the residents in the surrounding districts will be gratified to learn that the third annual has been fixed for to-morrow evening. 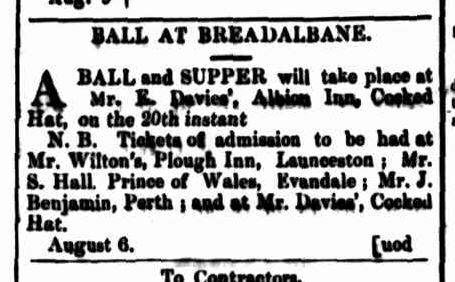 The application of Mrs. Martha Allen for transfer of the license of the Albion Hotel, Breadalbane, from Mr. Joseph Brown, was granted. 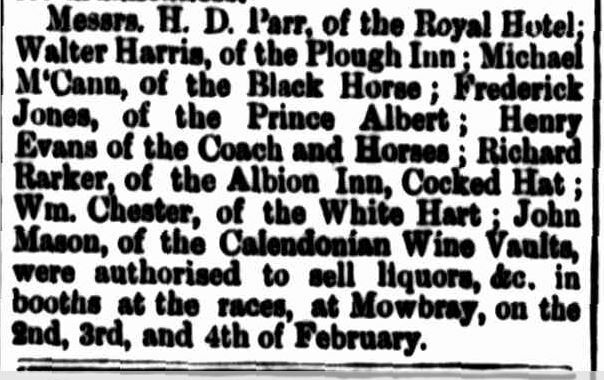 Application of Mr Richard Barker for a transfer of the Albion Inn, Breadalbane, from Mrs Martha Allen was granted. On reading the application of Mr. Joseph Brown, of the Cooked Hat, a very formidable opponent appeared in the shape of a man named Alcock, who resides somewhere between the Cocked Hat and Perth. This Mr. Alcock is that old correspondent of the Examiner, who, some ten or twelve years ago, was in the habit of writing letters of complaint against the Longford Police. The grounds of opposition were — 1st. That one day when Mr. Alcock was passing Brown’s house, some very jovial fellow was at Brown’s door drunk, and what is of still greater importance, the man actually had a glass of liquor in his band at the time. 2nd. That some woman, whom Mr. Alcock had seen at Brown’s, was a harlot; and although he would not admit that he was himself able to prove the fact, he wished the Bench to believe that this same woman got her living by harlotry. That she was in the habit of stopping all night at Mr. Brown’s, and although he could not exactly prove it, he had seen her come out of the house in the morning -when she had gone in, Brother Alcock did not say. This part of the opposition was chiefly hear say. Some of the audience thought that poor old Alcock had met with a rebuff from the lady alluded to, and hence his vindictiveness. The 3rd charge against Mr. Brown, was that Brother Alcock’s nerves had been dreadfully shocked on having heard that Brown had attended a funeral at Perth, and on that solemn occasion, had got drunk ! And further, that Brown was in the habit of getting drunk, both at home and abroad. These charges the pious Alcock was not able to prove — all hearsay. The Bench having listened to Alcock with great patience, after hearing the poor old man talk a great deal of silly nonsense, promised him that Mr. Brown should be cautioned, and so the matter ended. Mr. Brown, therefore, will be CAUTIONED ! 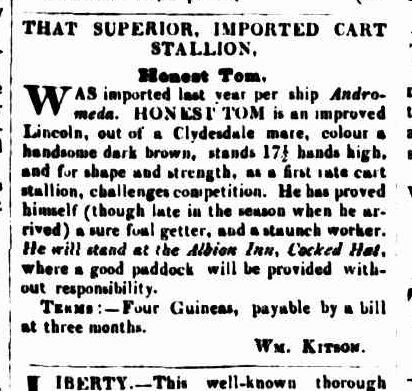 from behind the bar at the Albion Inn, Breadalbane, the property of Richard Barker, and sentenced to two months hard labor. 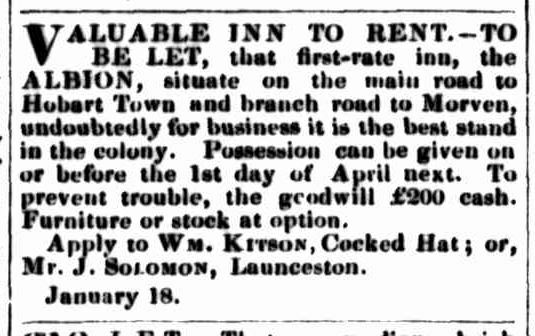 The historic building known to old residents as the Albion Inn, Breadalbane, which was a stopping place for the Page line of coaches between Launceston and Hobart in the early days, was destroyed by fire to-day. The building is associated with the bushranging days having at one period been the rendezvous for outlaws. It has, however, been unoccupied for some years past.